The 5 eyelet desert boot is a timeless classic. This Roamers desert boot was one of the first boots made by the company and year on year has proven to be the best seller. For those of you who have been in the military i'm sure this boot needs no further introduction. The micro sole is super lightweight and has been designed to be flexible at the same time. The padded collar adds to the extra comfort and stability that these boots provide effortlessly as you wear them throughout the day. Why not add scotchguard protection to your boots for only £1 extra. Scotchguard is a treatment which is applied to your boots at the time of dispatch. The scotchguard helps to repel water and dirt and increases the longeivity of your desert boots. Review Summary - 4.8 out of 5 based on 37 ratings. 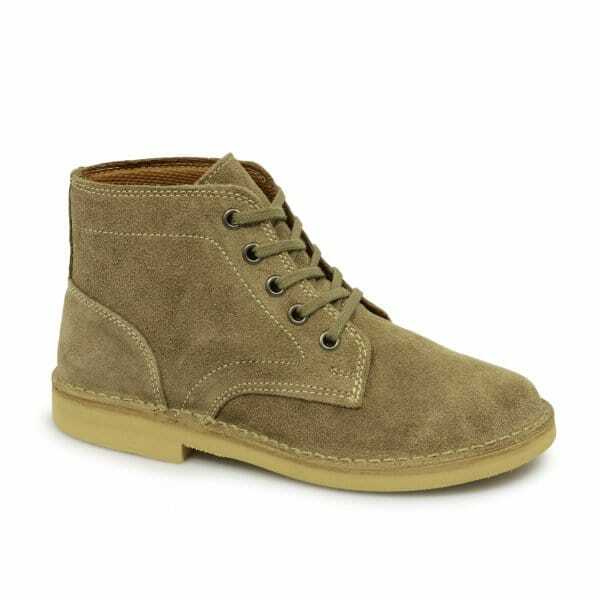 Simple pair of desert boots without 'designer' price tag. Bought these boots to replace an older more expensive pair and was very pleasantly surprised how nice they are and the quality of the product for the low price. Will definitely buy another pair from this site, thanks. Bought these for my husband as part Christmas present and he seems pretty pleased with them. These were bought as a gift. The person I bought them for has been wearing them and is very happy with them. My most worn footwear, and over many years I've found Roamers to be one of the best. Nice and comfortable to wear all day. Just wish they would come with a spare pair on laces. My husband is very pleased with his boots, he has been trying to find another pair, and we came across these, great value for money, and arrived so promptly. The most comfortable desert boots I have worn for along time. I love them ... fantastic quality materials on both the upper and sole .. With a minimum of care these should last years . I would suggest buying insoles for these , as I do for all shoes so maybe thats just a personal choice .. Overall ...I am very happy with these boots ... Light , strong , neat and they look even better once you've worn them a while and they look "Lived in" ..
Bought as a replacement for a pair of 30 year old desert boots (ex Army and Navy Surplus). Much lighter weight than these originals, due to a softer sole, but look identical in every other way. Will be interested to see if they last just as long. Have worn most days since receiving them, and the build quality feels good and strong so far (even though I have got them wet on a couple of occasions). Good comfortable fit, and good price. These boots had to do a job of work in real desert conditions, so were properly road tested. The design was appropriate and they stood up to it remarkably well. Price was very reasonable. On a previous trip boots from another manufacturer came apart at the soles, these showed no signs of this happening! Very good. Husband is very happy with these Desert boots but we had problems with sizes. I inquired if these came up small as he usually gets a size smaller in Desert boots but answer from Customer service was unclear. Was told not to worry as free returns and free delivery if size incorrect, which is good, but not needed if the agent had known the answer. So after time spent with returning and waiting for new size, we finally were happy with the purchase. I would however suggest to other buyers that you will probably need one size smaller in Desert boots. I chose these boots over several others I looked at on ebay, and I have not been disappointed. The uppers and the soles are good quality and I think they are first class value for money! Good value,excellent built quality and comfortable.Fast delivery with hassle free purchase. I would strongly recommend.